McGill students are buckling down in their fight to re-open the Arch Café. On Sept. 22, hundreds took to the university’s downtown campus to protest the closure of the Architecture Café—McGill’s last student run eatery. 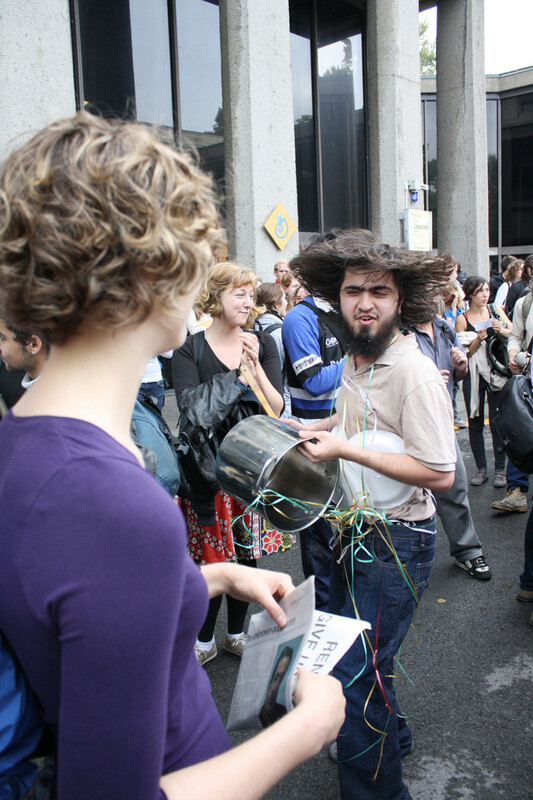 Wearing multi-coloured lab coats and hardhats, engineering students led protesters as they marched across campus and through McGill’s gated entrance where they were egged on by honking motorists. “The Architecture Café held a special place in the hearts of architecture and engineering students, but also students at large,” said Alan Cyril, an executive on McGill’s Engineering Undergraduate Society. Over the summer Morton Mendelson, McGill’s head of Student Life and Learning, decided to shut down the Arch Café without consulting any of the university’s student groups. Despite this claim, Mendelson has yet to make any of the café’s financial records public. The protest was the latest in a series of steps undertaken by students to persuade administration to reopen the café. On Sept. 7, the Architecture Student Association and the EUS put forward a plan to re-open the café under both groups’ management. The proposal was rejected. At a Sept. 13 meeting with Mendelson, Student Society of McGill President Zach Newburgh presented the administrator with a memo showing that 80 per cent of undergraduate architecture students are in favour of reopening the café. Mendelson has since denied telling Newburgh he would reconsider his decision to close the Arch Café. The work to re-open the café continued beyond the demonstration. Midnight Kitchen—a McGill student group that provides students with on-campus vegan meals—helped organize a strategizing session to discuss further pressure tactics on Sept. 27. 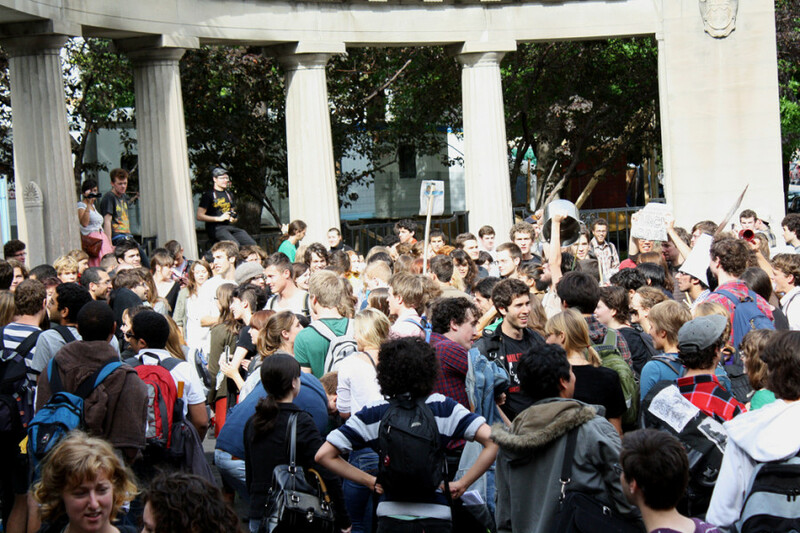 Protesters met outside McGill’s Leacock building, where the university’s student governing body was holding their first meeting of the fall semester. 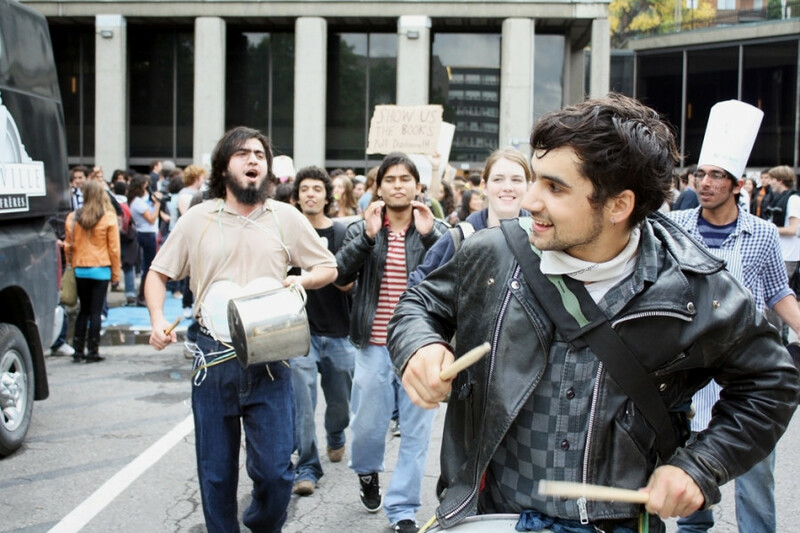 An improvised drum core banged wildly on their instruments as the crowd moved towards the MacDonald-Harrington building, site of the now defunct café. Most of McGill’s cafeterias are owned and operated by Aramark Canada, a food service company that has over 400,000 student clients across the country.